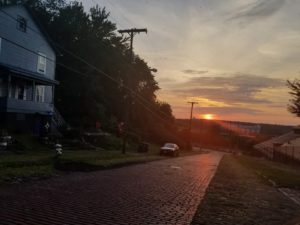 Akron Artwalk is adding artsy locations for seeing the work of local creatives as wells and unique shopping in the historic art district and Northside. ARTWALK means events in downtown Akron! Artwalk is always the first Saturday of the month, 5-9 pm. Summit Artspace and its Artwalk partners are underwriting the trolley so you can travel in style and comfort! At Summit Artspace you will find artists working in their studios. Many of the studios double as shops so you’ll be able to browse the artwork for sale. There are often special events with music. Galleries are open and admission is free. The galleries will regularly exhibit new and wonderful shows that include photography, painting, sculpture, collage, glass, found objects and fiber artistry. Here is map of floors 1 and 3. Check our social media:Facebook, Twitter and Instagram for cancellations. 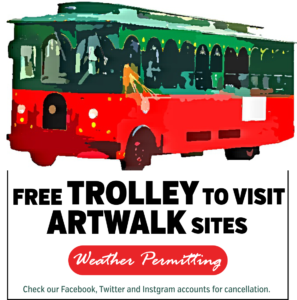 FREE TROLLEY TRANSPORTATION TO AND FROM ARTWALK LOCATIONS! 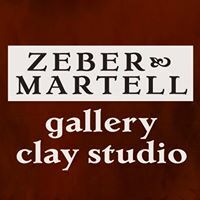 Zeber-Martell: See the exceptional functional and decorative ceramics by the artists, as well as a large selection of jewelry and much more to delight shoppers! Northside Cellar: Check out what they have in the shop plus Art 4 Artwalk. Bluff Blue Door Gallery: Visit the galleries in this unique setting. VISIT THE SUMMIT ARTSPACE FACEBOOK PAGE FOR MORE INFORMATION ABOUT ARTWALK SITES. There are new additions to the participating art businesses as the monthly event grows. See the Summit Artspace event and exhibit calendar for directions.